The gals at Funky Hannah’s have always loved beads! Our store is named after five generations of ‘crafty’ Hannahs in the owner, Amanda’s family. Amanda’s mother – Hannah – gave her a gift of seed beads as a child more than 30 years ago and look what grew! 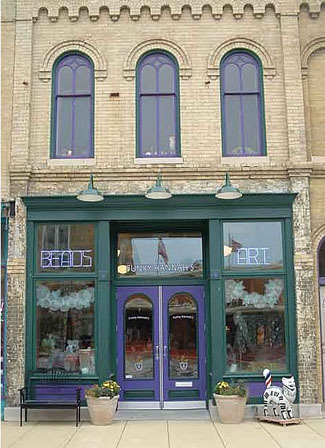 In 1997 she threw all caution to the wind and took her love of beads, experience running a non-profit social service agency and desire for community and created Funky Hannah’s in a charming 1860’s renovated storefront in the heart of historic downtown Racine. Dreams can become reality! Now in our sixteenth year, we’re having more fun than ever! 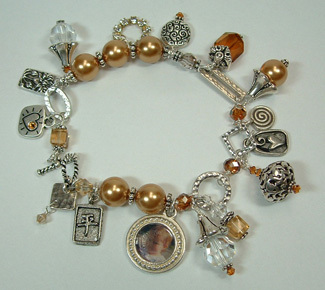 Our team of knowledgeable staff – all bead artists themselves – offer outstanding service to all of our customers. The relaxed environment and amazing inventory of beads make shopping at Funky’s almost as much fun as creating with the beads we sell. So now you know that no one here is named Hannah but we are all a little Funky. Our flower pot logo came from one of the ‘Funky Hannah’s . . . Grandmother Miriam Hannah Gottshall painted this motif on a set of china in 1927 and gifted it to her only granddaughter. When looking for inspiration for a logo, Amanda didn’t have to look far! There it was, in her corner cupboard! Established in 1997, we are located just 25 miles south of Milwaukee and 75 miles north of Chicago on the shores of Lake Michigan, in a charming downtown surrounded by shops, cafes and the nationally renowned Racine Art Musuem. We are a full service bead store with enthusiastic, knowledgeable and friendly staff who actually use the all the merchandise we sell! We have a large selection of Japanese seed beads in sizes 15º to 3º, hex cut, triangles, drops, peanuts, Delicas, magatamas, tilas and more. You’ll find a variety of Swarovski™ crystal including many custom coat colors. Czech glass beads in all the fabulous new shapes designers love: two holed Tilas, Rizos, Rullas, Tiles, Bricks plus a stunning selection of leaves, flowers and firepolish. We love both freshwater and Swarovski™ pearls, semi-precious stones and great books. You’ll find the full line of TierraCast™ metal beads, charms & clasps, spools and spool of unusual chain and leather cord by the yard in 1, 1.5 and 2mm sizes in all colors of the rainbow. We carry craft and precious metal wire in loads of gauges and all the essential tools for beading and wireworking plus great findings in silver, gold, antique brass, antique copper and gunmetal! 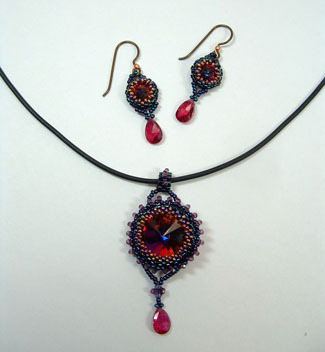 Our classes are dynamite and many of our designs are available as patterns you can take home and work on your own! Not lucky enough to live near our fabulous shop? Visit us at a bead show in the Midwest or shop on our online store…the next best thing to living in our neck of the woods. A road trip to Funky Hannah’s is always a blast! Make a day of it…wanna see all the fun things you could do in our fair city? Ever wanna learn to blow glass, tour Frank Lloyd Wright Buildings or take a culinary trip around the world in a charming small town? Discover what our pal John McGivern loves about Racine in this sweet PBS broadcast…and then plan your Road Trip To Racine! As always, if you need help finding something, just ask us…we’re happy to help! 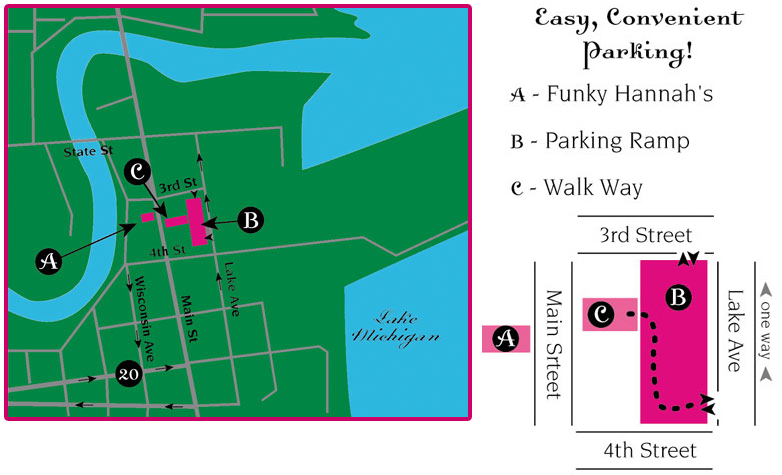 Funky Hannah’s is located approx. 25 miles South of Milwaukee and 70 miles North of downtown Chicago. You’ll find us on the Shores of Lake Michigan Between 3rd and 4th Street at 324 Main Street. (if coming from South/Chicago) to HWY 20. Exit 20 East, approx. 10 miles to downtown Racine. Take left on Main Street (HWY 32). Continue North 3½ blocks. Funky’s is on the West side of the street between 4th and 3rd Streets in the middle of the block. Metered parking is available in front of the store or in the easily accessible parking ramp just East of Funky’s.